Coming off of a rough three-game run, the Lady Bulldog soccer team needed a shot in the arm Tuesday at the Mack Chase Athletic Complex. They got it – along with 10 successful ones at the goal. 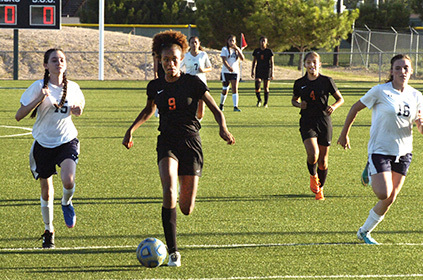 The Artesia girls turned a 4-0 halftime lead into a 10-0 mercy-rule victory over Ruidoso in their second home game of the season, ending the bout with 7:34 remaining and putting their 2018 record back on the plus side, 4-3. “I thought we did well,” head coach Tim Trentham said today. “With these kinds of games, it’s difficult to tell. Ruidoso had to move up a classification, and that’s not an easy task by any means. It’s the same as when we’re playing Hobbs or Carlsbad – there’s just a lot more talent to choose from in the larger classes. Under the leadership of coach Alan Riches, the Lady Warriors put forth a solid effort against the Lady ‘Dogs in the opening 40 minutes Tuesday, holding Artesia scoreless nearly until the midway point. A goal at the 25:22 mark, however, was followed by a second a few minutes later, and the Lady Bulldogs closed out their first-half scoring with 10 and four minutes on the clock respectively. The play would continue to remain predominantly on Ruidoso’s half of the field as the second 40 minutes began, and this time, the Lady ‘Dogs were able to open the offensive floodgates. Five more goals came over the course of an 11-minute span to quickly place Artesia one shot away from the mercy rule. They secured it with 7:34 to go in the contest. “The fact that we can score from a variety of different places with a variety of different girls is really what stood out from yesterday’s game,” Trentham said. “We have three quality finishers, and that’s a good thing – we don’t have to rely on just one person. We’re getting good distribution. Tuesday’s victory snapped a three-game losing streak that began Aug. 25 at the Goddard Invitational and continued through battles with Class 5A Hobbs and Clovis. The Lady ‘Dogs were shorthanded in all three of those contests, as well, and will be looking to put a better foot forward Tuesday, Sept. 11, when they head to Clovis for a rematch with the Lady Wildcats. In the week between, Trentham says his team will continue to get comfortable in their new formations. “We’re just trying to get everybody used to who’s around them so they can build that chemistry,” said the coach. “I’ve had to retool everything a little bit, changing up our formation, trying to figure out our rotation of who’s going where. We scrapped everything after Hobbs and Clovis, so we’re rethinking what’s better for us. The Bulldog soccer team picked up its second win of the season Tuesday in Ruidoso, 6-0 over the Warriors. No further details were available as of press time. The ‘Dogs will now prepare to return to their home stomping grounds Saturday for a bout with Class 1A-3A Hatch Valley. The Bears currently stand at 3-1 on the year with a pair of wins over Silver City and one against Deming, and a loss to Gadsden. Varsity action will begin at 3 p.m. Saturday at the Mack Chase Athletic Complex.